Like Nasa astronaut Jack Fischer demonstrating how to eat pudding in space. From passionately debating about silent gifs and farting animals to astronauts eating pudding and pulling epic pranks in space, here’s how science Twitter absolutely excelled in 2017. The world was not ready for a Twitter debate about farting animals but one thing led to another and soon the hashtag #DoesItFart became a raging hit. It started when Daniella Rabaiotti, a PhD student at the Zoological Society of London, asked on Twitter whether snakes fart. Soon biologists, ecologists, zoologists and everyone else started listing animals that break wind. #DoesItFart..Yes! My pet male Indian cat. I heard him doing it many times. Then Nick Caruso, a PhD student at the University of Alabama, created a database of trumping animals. The internet’s combined efforts led to a handy book aptly titled Does It Fart? The Definitive Field Guide to Animal Flatulence, compiled by Rabaiotti and Caruso. It’s not easy to eat when you are floating around on the International Space Station (ISS) in microgravity, but Jack Fischer was not one to give up easily – especially when it came to sweet treats. 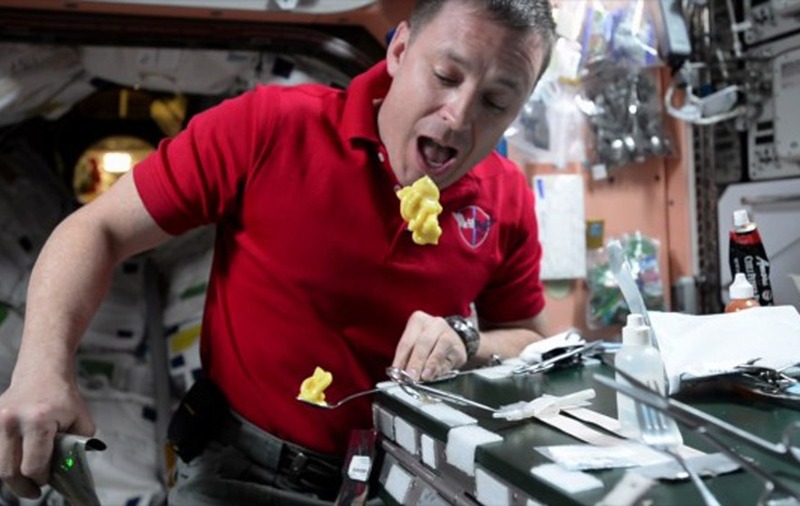 The Nasa astronaut, who described the spacecraft that took him to the ISS as “a burrito of awesomeness, smothered in awesome sauce”, gave the world a masterclass on how to eat pudding in outer space. Unsurprisingly, Fischer’s video posted on Twitter shows the cream-coloured sweet treat floating around, but the 43-year-old doesn’t let his “leaning tower of yumiosity” go to waste. So as his dessert jiggles around unfettered by the shackles of gravity, Fischer chases a chunk of it and chows it down, making for some rather interesting scenes. The complex process of cell division may not be the stuff of rap music, but this US college student’s biology-themed video defied expectations to become a major hit online. Julien Turner, a sophomore at Morehouse College in Georgia, was asked by his professor to create a music video about any subject covered in class as a way to get extra credit. With help from his younger brother Justen, the 19-year-old marketing student took inspiration from Lil Uzi’s XO Tour Llif3 to belt out a rather surprisingly catchy number. Clearly not learning from the Boaty McBoatface fiasco (success), Nasa decided to enlist the help of the Twitter public to come up with a name for the planets in the TRAPPIST-1 solar system. In case you were wondering, the US space agency decided to go with its original suggestion. The internet’s favourite celebrity astrophysicist, Neil deGrasse Tyson, decided Game Of Thrones was worthy of interest from a scientific perspective. Using the hashtag #GameOfThrones, Tyson dissected a few scenes from HBO’s hit show. He questioned the fact that the chain used to pull Daenerys Targaryen’s dragon, Viserion, from the lake didn’t appear to have any tension. However, he did praise the wingspan of the CGI dragons on the show, saying they are “sensibly large, as their body weight would require for flight”. As the most retweeted science communicator of 2017 (with 85K RTs), Tyson takes the responsibility of separating fact from fiction quite seriously. So naturally, when flat-Earthers dominated media headlines, he decided to post a fake photo of a lunar eclipse, with the caption: “A Lunar Eclipse flat-Earthers have never seen”. The photo pokes fun at those – including famous faces such as B.o.B. and, more recently, Freddie Flintoff – who reportedly believe that the Earth is not spherical-shaped. Jennifer Harrison, a science communicator who once tweeted an entire genome, made sure that just like every living thing on the planet, the humble dung beetle deserves your utmost respect. When told by someone that this insect wasn’t as amazing as other creatures that walk the planet because they “roll poo”, Harrison sprang into action with an enlightening Twitter thread, pointing out that the dung beetle is actually quite clever and uses the Milky Way to navigate in a straight line. Peggy Whitson set new records by becoming the oldest woman on the ISS and the oldest woman to do a spacewalk. But judging by the epic prank she pulled on fellow astronauts, she may as well add “the best space prankster” to her impressive resume. While in space, the 57-year-old Nasa astronaut tweeted a photo of herself floating around in a white cargo bag that fellow astronauts Shane Kimbrough and Thomas Pesquet zipped her into. Whitson said the two astronauts then took the cargo into the Russian side of the ISS and gave their cosmonaut colleagues Andrey Borisenko, Sergey Ryzhikov and Oleg Novitskiy a surprise when she “popped out” of the bag. The internet always loves a good old puzzle but people were left utterly baffled when they “heard” this silent animation. The gif, created by Twitter user HappyToast and posted by psychologist Dr Lisa DeBruine, shows a skipping pylon appearing to emanate a “thudding” sound that clearly only exists in our heads. Experts chalked this down to the brain trying to fill in missing information that we think should exist. The gif actually first made its appearance in 2008 but went viral in 2017, thanks to the indomitable power of social media.